Just when you thought milkshakes couldn’t get any better – we have gone and barrel aged it – in Bourbon! For those lucky enough to try the original version, you can except more of same – much more! This rich and creamy stout, has got richer and smoother! Extra vanilla has found it’s way from the barrels to the cans! And then comes the bourbon! A lovely warming and complex mouth feel, with each flavour playing it’s part. Coconut and vanilla to the fore, chocolate, bourbon and oak to finish. Lactose and brown muscovado sugar additions complete this one of a kind brew. 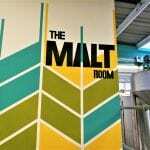 Malts: Lager, Wheat, Oats, Caramalt, Carafa Special 3, Dextrine and Chocolate.